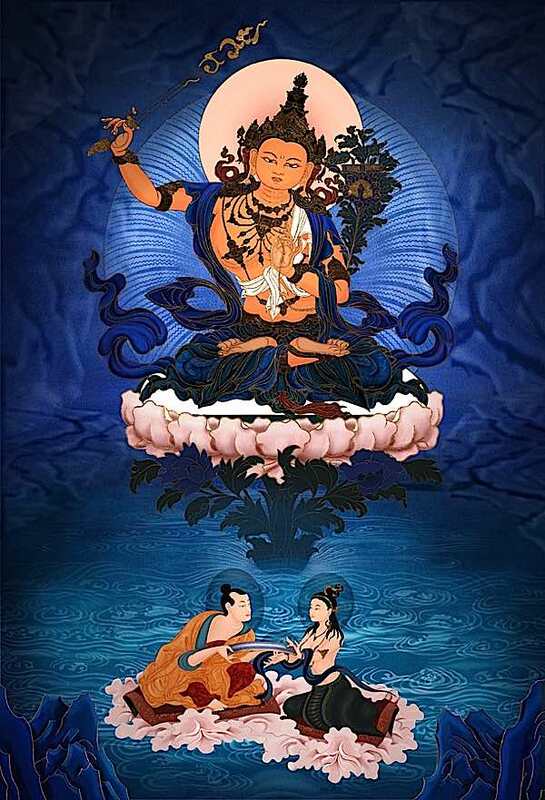 We feel warm, comforted, and supported in the youthful arms of Manjushri. More importantly, we receive the gentle wisdom we need to progress on the path. Manjushri is the favorite practice of scholars, debaters, teachers, writers, scientists and thinkers — but he is approachable for all beings. 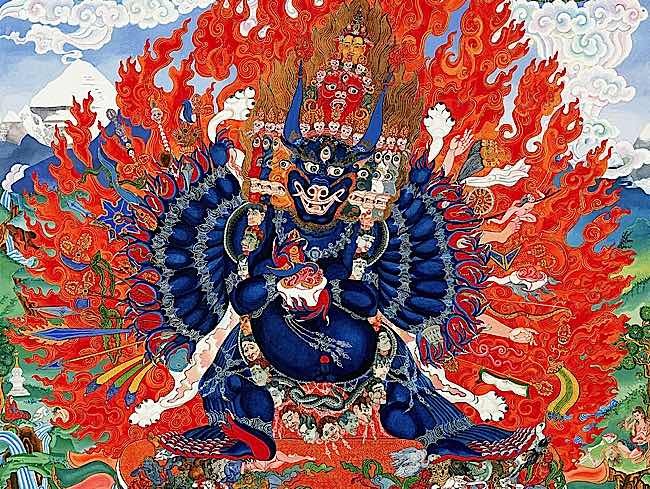 Vajrapani: power and strength and protection. 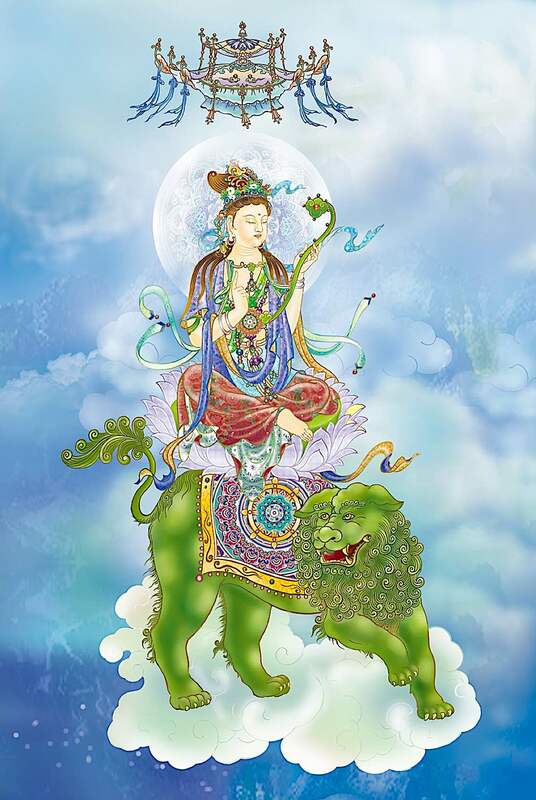 Manjushri practice and devotion is suitable for all beings. He is not a lofty, scary, wrathful, stern, unapproachable deity; quite the opposite. He is down to earth (earthy, golden colour), kind, smiling, welcoming, youthful, and beautiful. 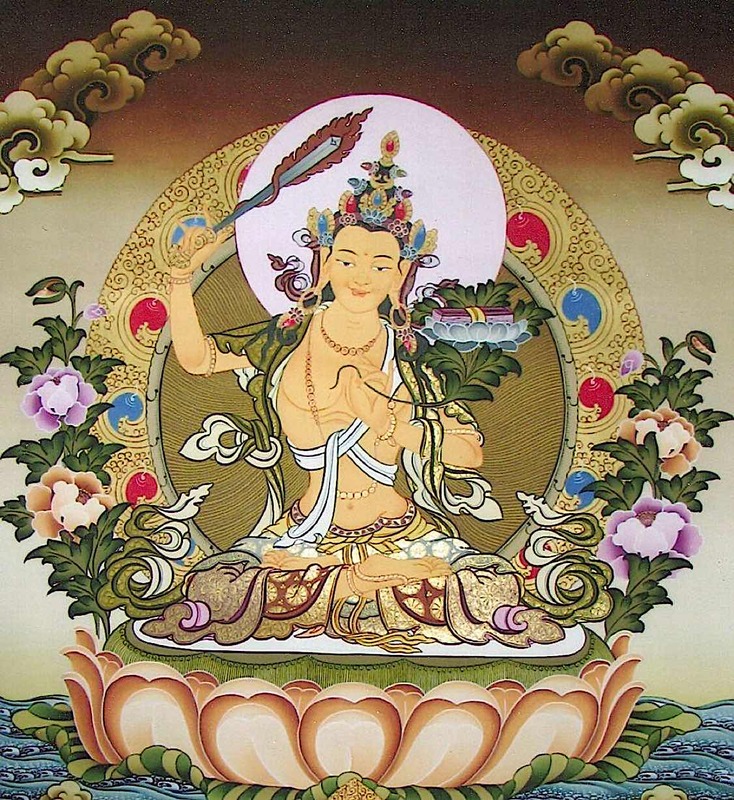 Even though labels are, in many ways, the antithesis of ultimate (or transcendental) wisdom — since imputed labels are one of the incorrect perceptions of sentient beings — nevertheless, Manjushri’s name describes his essence; his name translates as “gentle glory” or, variously, “wonderfully auspicious” or “sweetly glorious” or “gentle friend” (from the Tibetan). His perfect Pure Land is Vimala, in the East, and he is associated with Vairochana (Tibetan, nangpar nangdze, English Buddha Resplendent.) His other names include Vakishvara (Lord of Speech.) As an emanation of Vairochana — who vowed to emanate throughout the universe as a youthful Bodhisattva of Wisdom — he represents the “beginnings” of wisdom and our own ability to achieve it. Manjushri does not give us the answers; he grants us the process to find our own wisdom. The beginnings of wisdom, and that first all-important insight. He especially helps us see through the delusions of duality. In the same way, we must use labels to imperfectly describe the perfect, the language of symbols is especially important for those who seek insight from glorious gentle friend Manjushri. In many representations, he holds aloft the flaming sword of wisdom: the blade cuts through the incorrect perceptions of reality, bringing us sharp insight into Shunyata, or Emptiness. The sharp edge cuts through delusions. The sword, in Sanskrit, is called a Khadga. Not only is Manjushri’s sword a symbol of discriminating wisdom, but it also helps us cut through delusions, aversions, attachments, and all the things that trap us in our dualistic world of Samsara and suffering. In his other hand is the Prajnaparamita Sutra or text — the Perfection of Wisdom teachings, usually on a sacred lotus. The symbols and iconography can vary depending on culture. In Tibetan symbolism, he is normally crowned with Bodhisattva crawn and appears youthful, a young man often described in visualizations as 16-years old. Chinese Wenshu sometimes has different iconography: holding a ruyi sceptre and riding on a snow lion, for example. But the symbols always focus on wisdom. There are also specialized forms of Manjushri: Black, Orange, Four-armed Namsangiti, wrathful Yamantaka, and many others. 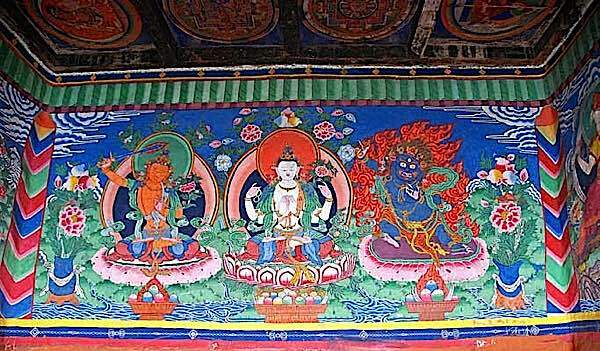 For instance, as Namsangiti, he is yellow with one face and four hands and holds in the first right hand a blue sword of wisdom licked with flame, and in the left at his heart, he holds a pink utpala flower; then, the blossom at ear-level supports the Prajnaparamita sutra. In the lower two arms are a bow and arrow. Jampal Tsanju is another emanation of Manjushri with one head and four hands holding a sword, the Prajnaparamita sutra and a bow and arrow. He is pink or white with one face and four hands. There is also a three-faced form. 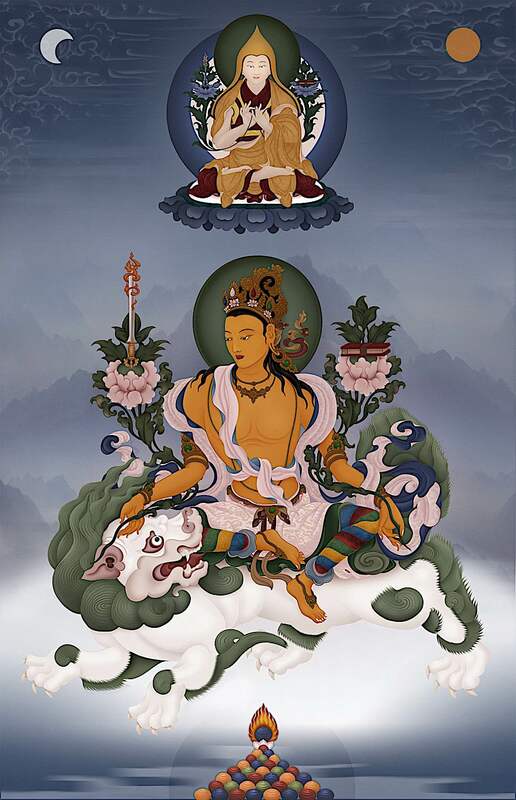 Why is Manjushri always visualized as a beautiful youth of sixteen, in the prime or beginning of his manhood? This important symbol reminds us that Manjushri is the beginning of insight. Within his practice is also the ultimate completion of practice, as represented by the “Perfection of Wisdom” text in his hand. But, the youth symbolism is vital, since most suffering humans, even the most advanced among us, could be said to be just at the “beginning” of understanding and insight. 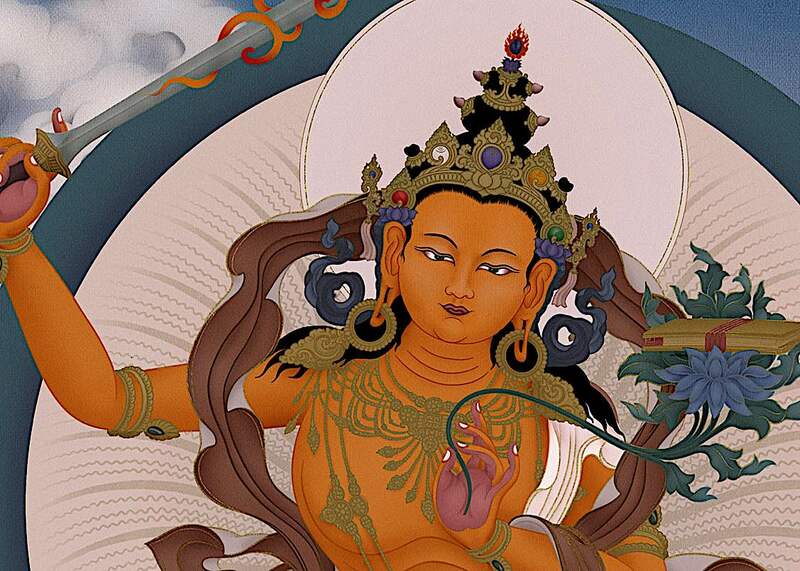 In Manjushri’s right hand is the wisdom sword, flaming with insight. 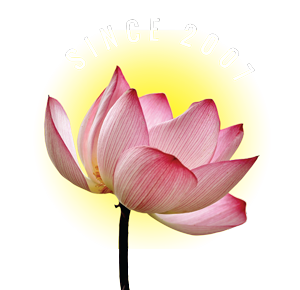 In the left hand, on a lotus, is the sacred Prajnaparamita sutras, the Perfection of Wisdom. He encourages us, with his smiling, gentle, face — the “gentle friend”, as he is called by many — and his simple symbolism. Unlike other Buddhist deities, his symbolism is ultimately simple. Just as the Heart Sutra (part of the Prajnaparamita sutras‚ is short and simple — clear and concise “Form is emptiness; emptiness is form” — at the same time his elegant simplicity is also ultimate complexity and deep, profound wisdom. Just as Heart Sutra expresses the vastly profound in a few hundred words, Manjushri’s symbolism of sword, text and youth likewise deliver a concise, yet vastly profound message. The most wholesome way to think of the “meaning” of the Manjushri mantra is to understand it’s root. Taken together, after the OM is ARAPACHANA (Arapatzana, Arapacana) — which literally is the syllabary of forty-two letters in the Gandari language (Sanskrit, Pali, etc). 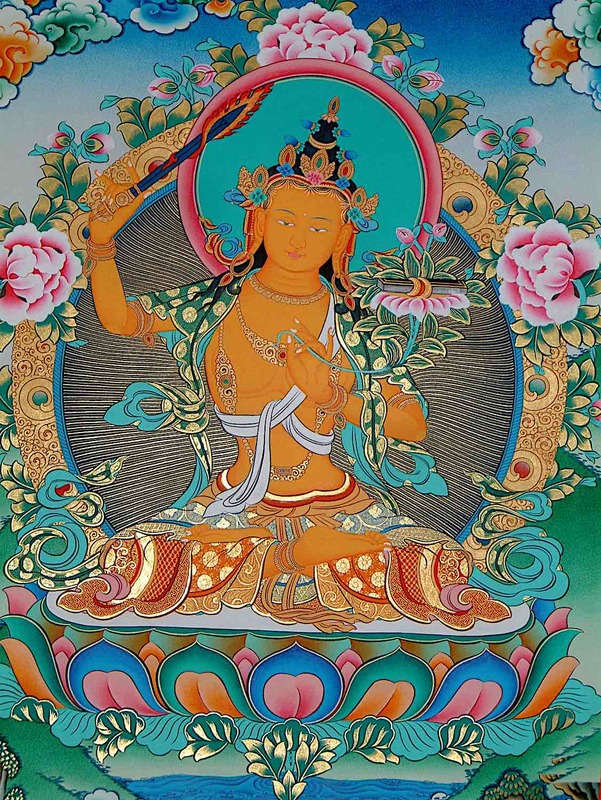 In some texts, Arapachana is another name for Manjushri. Clearly, this is very unique. Manjushri, then, in one way, can be said to be the wisdom of all the Dharma, expressed as the forty-two letters. Either way, when we recite Om Ah Ra Pa Tsa Na Dhih, we are basically reciting all forty-two syllables of the ancient syllabary, plus Dhi, which has a unique meaning. 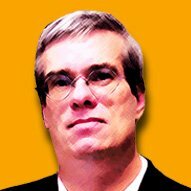 Why unique? Unlike other mantras, that often finish with Soha (Svaha in Sanskrit) — Manjushri’s mantra not only ends in the mysterious syllable “Dhih”, but we are instructed to repeat the Dhih as much as we can at the end of our recitation — as if our voices are merging with the Oneness of the Universe, or the Emptiness of Shunyata. We chant this “decrescendo” — with each breath softer and softer and softer, as if we are merging with Emptiness. We visualize our breath emanating countless Dhih’s golden like Manjushri himself, going out and blessing the universe, and purifying all negative karmas, energies and defilements — most of which arise from ignorance. Dhih, then, is an antidote for ignorance. Unlike other mantras, Om Ah Ra Pa Tsa Na are Sanskrit syllables not necessarily assigned “meaning.” While we can translate Om Mani Padme Hum (for instance, Padme is lotus), and other mantras, Manjushri’s mantra is the wisdom of Dharma, represented by sound and speech — here symbolized by syllables. In commentaries, however, Om Ah Ra Pa Tsa Na Dhi takes on many layers of meaning. NA — the insight that the essential nature of names and labels cannot be gained or lost. AH — stands for the direct understanding of the nature of phenomena. This realization develops as we examine everything. That means that we ask questions such as: What does my body and mind consist of? What do all the things around me consist of? As a result of repeated inquiry and contemplation, the realization of emptiness as the true nature of our mind as well as all external phenomena arises. Understanding of the emptiness of everything is the wisdom path. RA — The syllable RA represents understanding of emptiness from the Hinayana point of view. This approach emphasizes the emptiness of the self but believes that at the deepest level everything consists of very small subatomic particles. Similar views are held by scientists these days. These teachings of the ‘Hinayana’ emptiness are suitable for those practitioners that have difficulty in understanding emptiness in its ultimate nature. PA — stands for meditation. There are two basic types of meditation: the conceptual (thinking) and the non-conceptual (without thinking) meditation. In the conceptual meditation we rely on thinking about various concepts such as impermanence, suffering or karma. This is actually not considered a meditation in the strict sense. The ‘real’ meditation is non-conceptual and means that we see the nature of phenomena directly. In our practice we usually first combine the conceptual and the non-conceptual meditation until we are able to rest in the nature of mind completely without thinking. For example, if you have to ask yourself whether your meditation is conceptual or non-conceptual you are practicing conceptual (thinking) meditation. If you engage in a true non-conceptual meditation you don’t have to check whether your meditation is conceptual or non-conceptual – your feeling of resting in the nature of mind is so reassuring that there are no questions to be asked. DHI — represents the wisdom path teachings. It is the fruition of all the practices represented by the previous syllables. We can imagine that our samsara mind is like a block of ice flowing in the water of nirvana wisdom. The syllable DHI represents the fruition of our practice that melts the ice of our samsaric mind into water — its real Buddha nature. This is the Dzogchen view. As with most of the Bodhisattvas, Manjushri has emanated as a human — a wise teacher — to help all sentient beings. 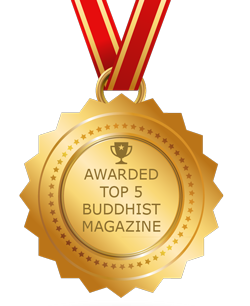 His most famous “emanation” is Lama Tsongkhapa, the founder of the Gelug tradition in Tibetan Buddhism. Other emanations include: Mahasiddha Virupa, Mahsiddha Naropa, Emperor Trisong Detsen, Translator Lotsawa Loden Sherab, Father of the Tibetan Language-Thonmi Sambhuta, Yogi Ra Lotsawa, Scholar Sakya Pandita, Buton Rinchen Drub, Panchen Sonam Srkpa, Duldzin Drakpa Gyaltsen, and Tulku Drakpa Gyaltsen.